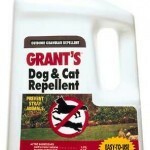 PRODUCT DESCRIPTION: Repellent Granules are small granules which release an odor dogs and cats don't like. This odor is barely detectable by people but targeted animals are very sensitive to it. 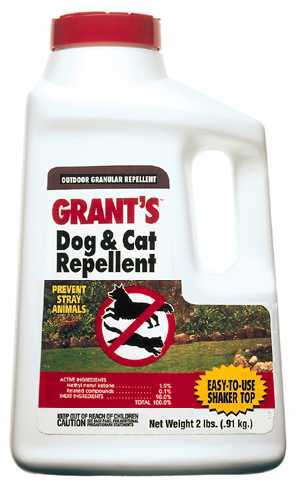 WHERE TO USE IT: Repellent Granules can be used anywhere animals are crossing into your yard. When properly placed out, you can form a “fence” which dogs and cats will not cross. This may be along a hedge row, tree line or flower bedding. You can also use it along property borders to create a type of "invisible" fence over which the unwanted animal won't cross. Be sure to apply it where they are entering and most likely to travel. Most dogs will establish routines and travel patterns and it is directly on these trails where you must apply this material to have success. RATE OF APPLICATION: Use 1 oz per 6 sq/ft of ground you want to protect. The rate is 100 feet per lb, which breaks down to about 1 oz per 6 sq/ft, and the key to using this material is to renew it daily till the animal quits coming around. Since dogs and cats are creatures of habit, they will establish trails over which they will want to travel as they make their way through your property. To stop them you will need to apply this repellent every morning, before noon, at these points of entry. The renewed odor they will find each day when they come around walking will cause them to go elsewhere. Expect to use the material daily for a week or two and once the nuisance animals move off to other trails, use it 1-2 a month to make sure they don't return.